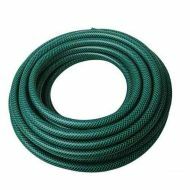 Polyester fibre reinforced PVC garden hose pipe. 3-ply construction for extra strength. Kink resistant 1/2 inch inside diameter in accordance with BS3746. Outside tap 2 way connector. 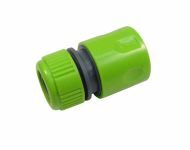 Compatible with most quick connect garden hose pipe systems including Hozelock / Gardena / Claber. 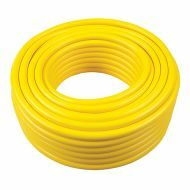 30m long heavy duty kink resistant garden hose pipe. 1/2 inch inside diameter, 3 ply construction for extra strength, Polyester fibre reinforced. 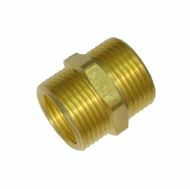 This threaded brass adaptor connects modern (3/4 inch BSP) Hozelock / Gardena type garden hose pipe fittings to the outlet of your older outside tap. Great for old taps with the less common 1/2 or 5/8 inch BSP outlet threads. 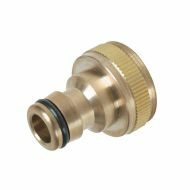 This brass push-fit hose connector fits on the end of your garden hose pipe. 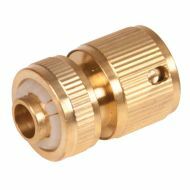 Universal brass push-fit hose tap connector, fits standard outlet of an outside tap (3/4 inch BSP). Push-fit hose snap connector, with 3/4 inch BSP male thread. 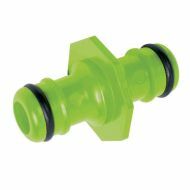 This push-fit hose connector fits on the end of your garden hose pipe. Use to join two pieces of garden hose pipe together. Colour may vary from photo, depending on what our supplier has been sending us. 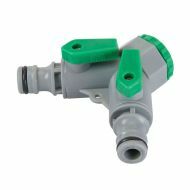 Universal plastic outside tap hose connector, fits standard 3/4 inch BSP outlet of an outside tap. Garden spray gun, featuring 9 pattern adjustable head with rubberised pistol grip. 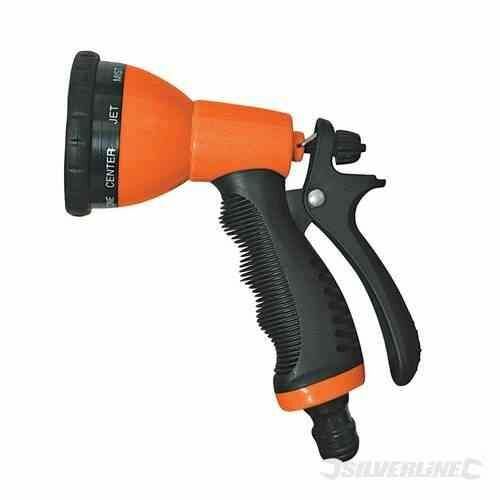 Includes quick hose connector (shown attached). 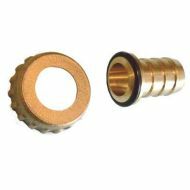 Brass hose union nut and tail, the thread on this item is 3/4 inch BSP, which is the normal outlet thread for a 1/2 inch outside bib-tap. Does not suit the heavy duty bib tap in our store (code FNY), as it has a smaller 1/2 inch outlet - or the 3/4 inch bib tap (code FNJ).